Probably the most important of all of these points is ensuring you are in a comfortable position with the correct equipment. This includes a good quality, comfy, adjustable chair and ensuring your keyboard and monitor are appropriately placed. Not only are you more productive if you are comfortable, but there are also a whole host of physical problems you can encounter down the line if you spend long hours every day in the wrong position. 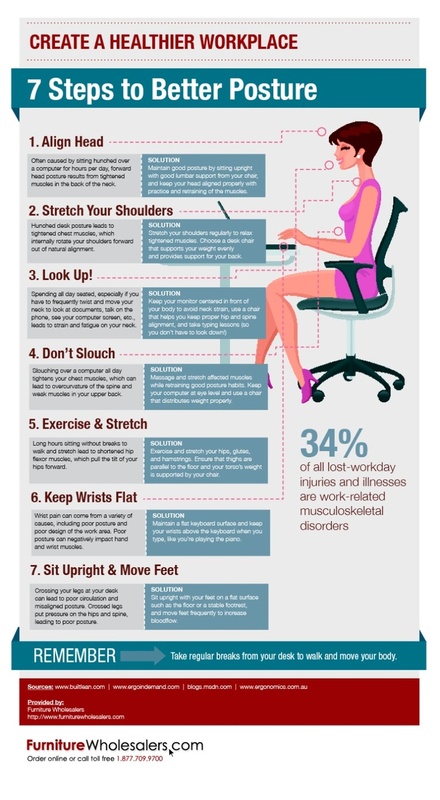 These include Repetitive Strain Injury (RSI), back problems, headaches and eye strain. 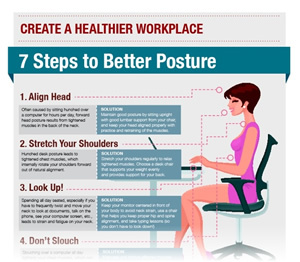 The diagram above describes some quick tips to enhance your posture (click to expand). Make sure your office is somewhere fit for purpose and not something you “make do with”. Ensure it’s a place you enjoy being and can feel relaxed in. If you are going to spend eight hours plus here, it’s worth investing in making it look nice too. This could be a touch of paint, but I like to put up a few posters – some of my hobbies and interests, but also some that are inspiring and help me feel creative. Everything should have it’s own home, after all, this is your office. When you get up for work, this is where you go. You wouldn’t expect to go to work at a corporate company and have to play “seek it out” with all the stationery, or spend your first hour looking for some paper to restock the printer. Ensuring things have homes, means less time spent looking for things and more time working, which ultimately means more time improving the turnover of your business. In my office, the paper is near the printer so I know how much we have. There is a drawer for envelopes, cables, notebooks etc, and filing cabinets that are labelled for any paper work that I have to deal with. There is always sticky notes and scrap paper near the pen pot (which is also fully stocked), so that I always have something to make notes on. Make sure your work space is well lit, preferably from natural light, but that you are in a position where you can avoid sun glare from the window (even if this is pulling a curtain over). If your are working in a dim environment (unless developing photographs of course), you can quickly become susceptible to headaches. There is nothing worse than being in somewhere that is too hot or too cold. Make sure you have the means to control temperature, either by opening a window to let fresh air in, or by buying a small heater for the winter – especially if you are in an out building. Having a comfortable climate will help you to keep focused. Make sure you can see the clock. If you set yourself times for tasks, it’s easier to plan your day. Either have a clock on the wall or somewhere you can see this easily. As productive as you may feel, working solidly through for nine hours it is important to have regular breaks. Set an alarm if you have to that prompts you to take a quick break away from the screen. Often I find that taking time out and coming back to something can give you a fresh perspective and prompt new ideas. In my office I have a large whiteboard hanging on the wall in front of me that contains a list of all my current jobs and allows me to organise my time throughout the upcoming weeks. It also means that I don’t have to waste time hunting through my inbox to try and remember what I should be doing. The whiteboard is one of my most effective tools in time planning and I would definitely recommend getting one. Have a tray or box for all unsorted papers to keep your work area free from clutter. Allocate some time each week to go through this box and deal with the contents as required. Try and keep the office for a single purpose – working. Although we do a few personal things on the PCs in the Office, this is predominantly where I come to work. This means at the end of the day when you are finished, you can leave the room and shut the door, essentially separating work life from personal life. By making just a few improvements to your home office you will definitely see the benefits when it comes to focus, motivation, morale and performance. Be proud of your office and make it yours. Have you implemented any of the tips above? Maybe you’ve done something that we haven’t listed. Leave us a comment below and tell us about your home office setup. This entry was posted on Friday, September 13th, 2013 at 9:25 am by +Steve Marks and is filed under Business Development. You can follow any responses to this entry through the RSS 2.0 feed.